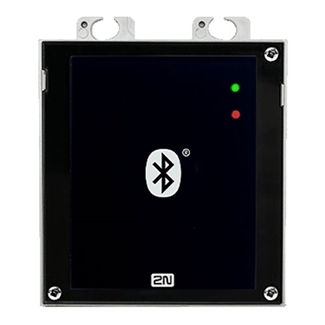 2N Access Unit Bluetooth Reader enables secure wireless entry using Bluetooth. This reader lets you open doors using a smartphone via the 2N Mobile Key app. The app's communications with the Access Unit are fully encrypted for extra security. You can even institute two-factor authentication by combining it with a PIN code entered in the app. 2N Access Unit Bluetooth Reader is simple to configure and manage, because it is a network-enabled device. You can monitor entrances and exits, set up new endpoints, and more using your IP access control system. The device comes with an anti-tamper switch to alert you when someone attempts to damage the unit. It is fit for indoor or outdoor installation. 2N 01368-001 used to be known as 2N 916013.